CHARLOTTE AMALIE — Now that pay raises have been distributed to several government agencies in fulfillment of Gov. 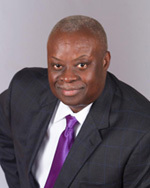 Kenneth Mapp’s first State of the Territory address promise — the Virgin Islands is once again on the brink of financial disaster. Mapp told Virgin Islanders that he had inherited a Virgin Islands government that was basically broke from former Gov. John P. DeJongh Jr. in January of 2015 — but in May of 2016 — the government is back in the same boat. Meanwhile, Congress’s plan to throw a lifeline to Puerto Rico has attracted the attention of federal lawmakers who see the Virgin Islands’ financial position as being not that much different from that of the commonwealth 120 miles to the north of us. The Puerto Rico bailout bill passed a House committee last week would allow for a federal control board to oversee the finances — and potentially restructure the debt — of any U.S. territory, even though Puerto Rico is the only one now asking for help. Mapp (I-VI) and Virgin Islands Delegate to Congress Stacey Plaskett (D-VI) have blasted the bill, warning that it may tarnish its standing with investors. That concern is already starting to materialize: Returns on its securities are trailing the $3.7 trillion municipal market for the first time since 2011. The Virgin Islands, Puerto Rico’s closest American neighbor, has a relatively tiny population — about 104,300 — and a fraction of the debt, with $2.4 billion across all issuers. But divvied up, that’s $23,000 of obligations per person, even more than Puerto Rico’s $20,000. The territory and the commonwealth with shared cultures also share similar fiscal strains: declining populations, underfunded pensions, histories of borrowing to cover budget shortfalls and unemployment rates that are twice as high as the U.S. mainland’s. The territory’s bonds have long lured buyers across the U.S. because the interest on the securities isn’t taxed at the federal, state or local level. And unlike some American local governments, the territories — – American Samoa, Guam, Northern Mariana Islands, Puerto Rico and the U.S. Virgin Islands — can’t file for bankruptcy. That made investors confident they’d be paid back, a faith that was lost as Puerto Rico defaulted and Congress advanced legislation providing a way for distressed territories to reduce their debts in court if needed. Local leaders insist the government can and will pay what it owes, in part because of the way the bonds are structured. Many securities are backed by specific revenue streams, like excise taxes tied to rum production by Diageo Plc and Cruzan International Inc., that go straight from the U.S. Treasury to an escrow agent. Even bonds backed by gross receipt taxes, which offering documents say are “secured by its full faith and credit and taxing power,” also give the trustee a lien on the levies. Virgin Islands officials say they’ve had to borrow to make up for discrepancies in how the federal government funds territories relative to states. And they’ve called on Congress to extend tax credits for low-income workers to their residents and bolster Medicare and Medicaid payments as well. None of that was included in the Puerto Rico bill. Its securities are mostly in the lowest investment-grade tier, unlike Puerto Rico’s, which are deemed virtually certain to default. If the Virgin Islands issued pure general obligations, however, Fitch Ratings says it would rate them BB-, the third-highest junk rank. “In terms of the debt load, on a per-capita basis, on an income basis, it’s high,” said Marcy Block, the Fitch analyst who tracks the Virgin Islands. Aside from indebtedness, the Virgin Islands is grappling with similar economic and demographic trends as its beleaguered Caribbean commonwealth counterpart. The Virgin Islands’s real gross domestic product dropped in each of four years through 2014, according to data from the Bureau of Economic Analysis. 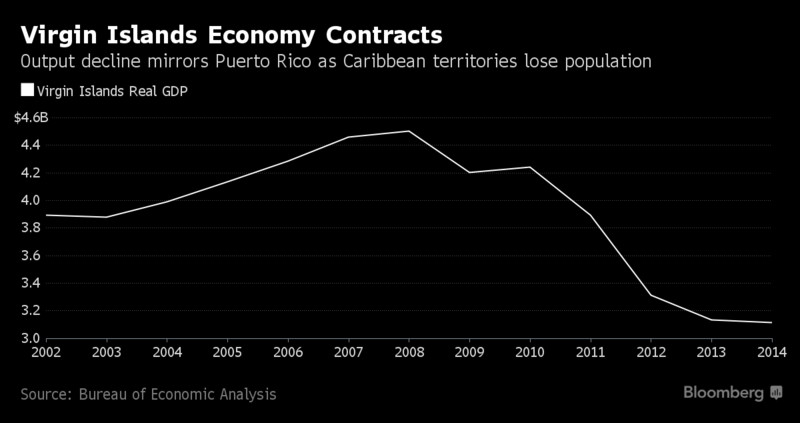 Like Puerto Rico’s, its contraction has been exaggerated by migration as residents leave in search of jobs. The Virgin Islands’s population is down 10 percent from its 2008 peak, according to BEA data, and the unemployment rate is 11.1 percent. The Department of Interior said in a September 2011 report that the Virgin Islands’s pension plan may be unable to pay what it promised to pay by 2025 — though a measure passed last year could delay that for a few years. Mapp, who’s unaffiliated with a political party, said in his first budget message a year ago that the territory’s general fund revenue hasn’t been enough to cover expenses for the past two decades. The island may end this year in deficit as well.